Submitted by North Island College on November 29, 2016. 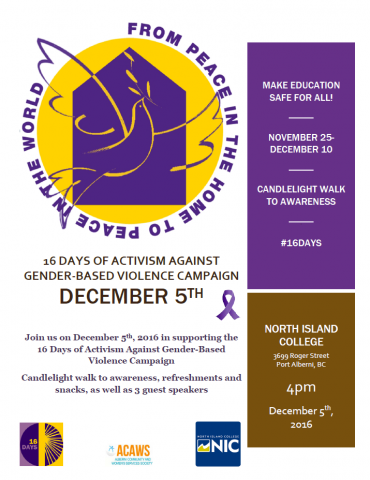 Join North Island College on December 5, 2016 in support of the 16 Days of Activism Against Gender-Based Violence Campaign. This is an event to commemorate the 14 female students who lost their lives in Montreal, in 1989, at l'École Polytechnique de Montréal. This year, NIC's Human Service Worker class in Port Alberni is organizing this walk, to focus on bringing together local members of the community. Time: 4 pm starting with refreshments, snacks and guest speakers. Short candlelight walk will follow, to support victims of gender-based violence.